The App Store is loaded with mindless distractions to fill your down moments, but you don’t have to play something dumb or monotonous to pass your time. You can still put your mind to good use by playing a good puzzler. Puzzle games range from inventive spins on the match-three formula to strategic navigation games with challenging physics game mechanics and more. It’s a broad mix of options and everyone can be sure they can find something uniquely designed to tease their brain with. 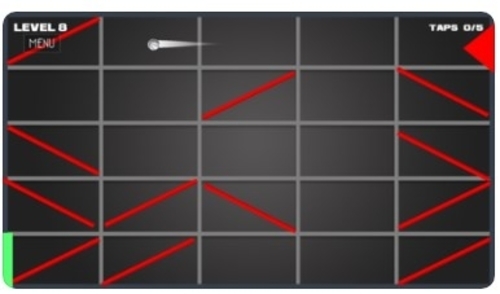 What kind of puzzle game is Ball Path? The Ball Path game is an excellent strategic direction navigation-based puzzler for every avid puzzle lover. Ball Path game mechanics require the player to be fast decision maker, with focused attention and logical thinking which makes it great brain exercise app for improving cognitive skills through simple and challenging game play. The rules of the game are simple and straightforward. Steer the ball in the right path by touching the right walls so it can exit the maze without touching the ends of the screen. Touch the least set number of walls and you get 5 stars, touch a few more, the number of won stars shrinks, touch even more and you get none and start losing your stars. As you progress through the levels, the game becomes more and more challenging and if you want to continue to the next level you should have at least 2-3 stars. If you are out searching for really challenging puzzle game to treat yourself with, try out Ball Path. You can download Ball Path for free at the App Store.